On Sunday, Devin Patrick Kelley, 26, clad in all black, wearing a bulletproof vest, and carrying an assault rifle, opened fire inside First Baptist Church in Sutherland Springs, Texas, killing 26 people. The victims ranged in age from 17 months to 77 years. Information quickly emerged that Kelley escaped from a psychiatric hospital in 2012 while he was in the Air Force, after making death threats against his superiors, trying to smuggle weapons onto the base where he was stationed, and being charged in a military court with beating his wife and severely assaulting his baby stepson. Some two and a half hours north of Sutherland Springs, Zo’e Nicholl and Katie Bird spend more time thinking about the warning signs that seemed so abundant in the life of Devin Kelley than most eighth-graders. 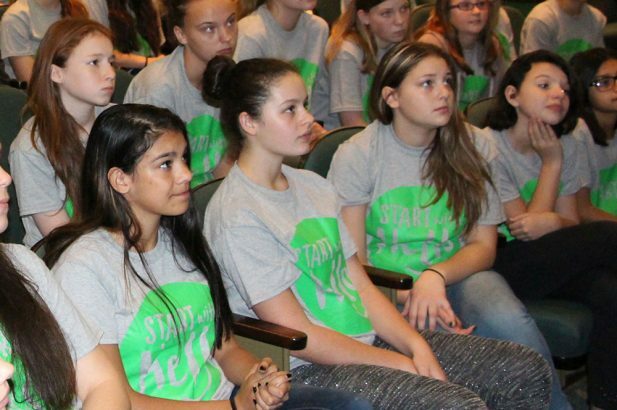 The Burnet, Texas, middle schoolers are among the 2 million children and adults who have been trained by Sandy Hook Promise, the initiative founded after the mass shooting in the Connecticut elementary school that is coming up on its fifth anniversary. The girls aim to empower their peers to learn the signs to intervene and possibly prevent gun violence. The program educates students to notice warning signs (in-person and on social media) of violence or self-harm among young people and to properly alert someone. Citing U.S. Department of Justice research, Nicholl and Bird point out that most threats of violence or suicide are known by at least one other person before they happen. Sandy Hook Promise, begun by family members of the 20 first-graders and six school staff members killed on Dec. 14, 2012, looks to build a movement around gun violence prevention and the passage of sensible state and national gun policy. Given recent events, it’s fair to say those goals remain a work in progress. 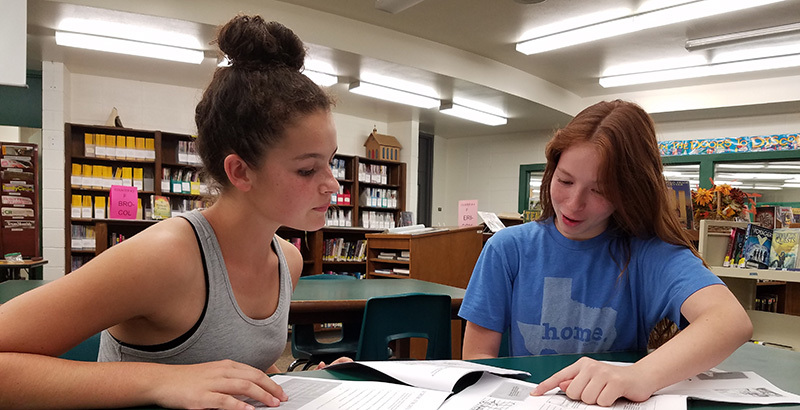 The two Burnet Middle School students talked recently with The 74 (before the Sutherland Springs shooting) about doing their part to stem the killings. The 74: What inspired you to get involved with Sandy Hook Promise? Zo’e: I was introduced to Sandy Hook Promise Foundation through my school. It was a Start With Hello program that allowed me to connect with people and develop friends. Sandy Hook Promise recognized us for the amount of work that we put in and I went to Washington, D.C. — I got to meet the heads of SHP. It was really cool and I loved it. Katie: I got involved with Sandy Hook Promise through interacting with group members and we decided that we were going to do the Start With Hello program. It was a lot of fun and it made a lot of people feel included and made sure there were no social outcasts during that time. We’re working to make that the norm in our school. Zo’e: We also have a program at our school called Say Something. It’s not a way to eradicate or prevent stuff, but it’s a way for me to recognize what’s going on in my school. So let’s say with a school shooting — I would be able to recognize if someone is having those dark thoughts. I could be the person that they need me to be and I can help prevent that from happening. Katie: Say Something is a program where we can help students who feel socially outcasted, but more importantly it’s to look for signs and signals that someone may be planning to hurt themselves and others. We’ve been reading through some of the statistics and 70 percent of shooters or people who commit suicide tell someone before they do it. So most of it is preventable. The 74: What are some of the signs that you look for that can tell you whether or not a person is looking to harm themselves or others? I would connect with those people, become their friend, and you would be able to see the signs, stop it or help them. Literally, say something. Katie: Another thing, this is more on the suicide end, is they may give their stuff away or they look into how other people killed themselves and do more research on it or if they have a fascination with death. Another statistic was that mass shootings are planned six or more months in advance. We have six months to look for these signs. If we can train kids now to look for these signs, as they get older, they’ll look for that and they’ll see the signs and they’ll say something. The 74: I don’t know if you’re aware, but the Las Vegas gunman, Stephen Paddock, was planning this for months (or longer). He went as far as checking out different locations and sent his girlfriend to the Philippines. Given what you know about signs, do you think it was possible for people to have picked up on something? How could others be more aware about the people around them? Katie: We can’t walk up to a person and automatically know these things. We need to educate everybody, kids and adults, about these signs because you can only tell if you’re close enough to a person to notice a change. The 74: What would this education look like? How do you see the young people in your generation making a change to prevent a lot of these mass shootings in the future? Katie: We need to bring the Start With Hello and Say Something programs and try to continue that throughout our lives to look for these signs in people to be able to help them. Zo’e: We don’t have to follow exact guidelines — everyone has different preferences. Sometimes talking to a person would help, sometimes sitting next to them during lunch and not saying a word to them helps sometimes. Just being there would help. The 74: If students were interested in getting involved in violence prevention, how could they? Zo’e: Popularity is a thing in school and I think if we were able to provide a comfortable place and safe place for students to open up to the programs, it would help because people would want to come. Students would even invite their friends because they would want to help their friends because they care. Introducing it to more people and growing and expanding will help bring awareness. Katie: We can begin with the Start With Hello and Say Something programs. Say Something is all about preventing the violence and Start With Hello is about being more friendly and more open. I think if we learn to be more friendly and more open, maybe the violence would decrease greatly. The 74: Do you see yourself doing this work in the future? What would be your ideal vision for the country and for students to engage? Katie: I would like to do this as a job or work with the Sandy Hook Promise because we can get the word out to students who then go home and tell their parents. We can make the program for parents, kids, and put stuff up around our community. Any school can use these programs because they’re free and they make your community and your school such a better place. Zo’e: I would definitely try to invite people who want to help. If there are larger groups of dedicated students and adults helping them get the word out since students have a limited amount of contacts, it would attract more people. Kei-Sygh Thomas is a former editorial fellow at The 74 and a freelance contributor to the site.